Lock in a great price for Bazpackers - rated 9.2 by recent guests. The staff was amazing. Kudos to all of them! Really helpful in every aspect. Cosy, clean and tidy and friendly. Communal areas really clean and tidy. Rooms with a view! Lovely seats outside for sunny weather and socialising. Easily the best hostel I have ever stayed at. Beds are really comfortable, showers are amazing! Pod bed system so have individual lights and charger point and curtain over bed. Everything really clean, nice garden outside. Staff are really wonderful and showed me all the best parts of the city to visit. Staff were fantastic so friendly, helpful and accommodating. Great location, very central. When we arrived we were welcoming for a nice receptionist, Ian, who during all our staying was really helpful and kind. We had a really new and nice kitchen and 2 refurbished bathroom for only 3 rooms. All the staff was really nice and helpful. The hostel was really clean. The hostel is really very good locate for visiting the city centre or for public transport. In a walking distance you will find shops, restaurants and pubs. The staff is incredible and go beyond their role to make all guests feel welcome and have a good time. They even participate in games night! Absolutely loved it! Clean, comfy room. Excellent kitchen and bathroom facilities. The beds were super comfy, the staff was incredibly helpful and the views are amazing! Situated in Inverness, Bazpackers features barbecue facilities and free WiFi. Among the various facilities are a garden and a shared lounge. Local points of interest like Inverness Castle and Caledonian Canal are reachable within 200 yards and 2.1 km, respectively. Selected rooms here will provide you with a kitchen with an oven. 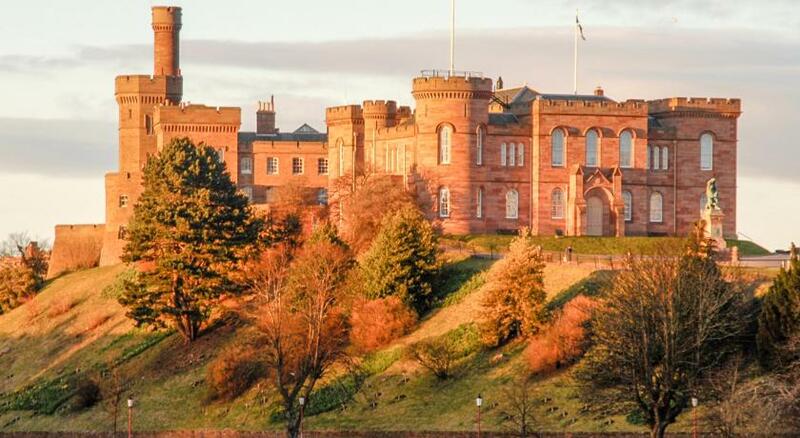 University of the Highlands and Islands, Inverness is 2.2 miles from the hostel. The nearest airport is Inverness Airport, 9.3 miles from Bazpackers. Bazpackers has been welcoming Booking.com guests since 4 Sept 2018. When would you like to stay at Bazpackers? House rules Bazpackers takes special requests - add in the next step! Bazpackers accepts these cards and reserves the right to temporarily hold an amount prior to arrival. The property will try to ensure group bookings are kept in the same dormitory, however guests must give the property prior notice. Please note, this cannot be guaranteed. Please note, the property cannot accommodate group bookings of 6 or more guests. Reception is open between 07:30 and 23:00. Guests may arrive before check-in and store their bags for free. Late check-ins can be accommodated with prior notice with the property and an additional fee of GBP 5 per half hour. We were 5 people but reserved 6 beds so we can have a 6 bed room to our self, when I booked that room open. But, when we got there, a bed in our room was already taken. They put a guest in that room and one of our paid bed was in next room. So, next room has free empty bed that I paid instead of our room. the location was great. the room was clean. Common areas are a bit small so less chances to socialise. The staff are phenonenal and made it such a great experience. The coffee machine would have been a luxury but when I got in before I took my coat of it started to leak all over the floor so I was cleaning before unpacking.